ARTHUR PETER MUTHARIKA, President of Malawi, said the mission of every generation should be to leave the world a better place for future generations. Today, that mission faced a mountain of challenges, including wars, political instability, violence, terrorism, radicalization, global warming and endless migration caused by conflict. Africa and the rest of the developing world were suffering dehumanizing poverty, the pain of hunger, insufferable diseases, disgraceful inequalities and unjustifiable gender imbalances. “The choices for human destiny, world over, lie with us in this Assembly,” he said, adding that “these challenges must be resolved by us or nobody else”. The international community had risen to the occasion and begun the journey of conquest with its adoption of the 17 Sustainable Development Goals, but that was just the beginning, he said. The sustainability of that pursuit depended on a common understanding and walking together as a community of humankind. For its own part, Malawi continued to guarantee basic human rights and offered every care to its brothers and sisters seeking refuge, he said. The country ensured peace, stability, security and tranquillity for everyone, while creating an environment for progress. It was governed under the principles of democracy and the rule of law because humanity was only safe when everyone was accountable to someone else. Pledging to continue to live in peace with Malawi’s neighbours, he highlighted his country’s record in peacekeeping and its active support of the African Union’s 2063 Agenda to “Silence the Guns” by 2020. 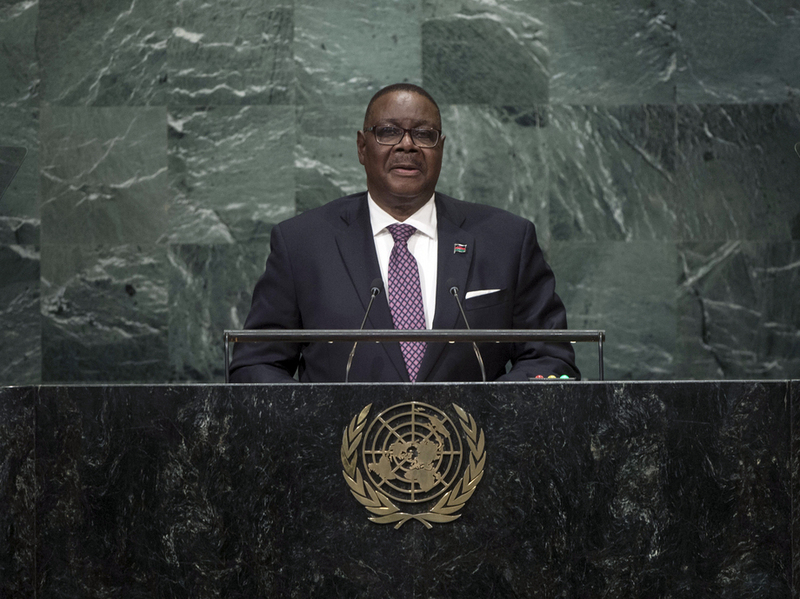 Citing Malawi’s steady but considerable economic progress, he said a combination of robust fiscal and macroeconomic reforms would lead to further growth of its gross domestic product (GDP), as well as more job creation and improved incomes. Malawi’s only major setback over the last two years had been the effects of climate change, he continued. The country had been struck by both floods and drought; 6.5 million of its people would require food assistance in 2016. While the Government was doing all it could, it also sought the support of cooperating partners and multilateral institutions within and outside the United Nations system, in the order of $246 million. Malawi would sign the Paris Agreement, which would also guide its domestic policy on climate issues. Describing additional progress in the areas of health, gender equality, trade, investment and market access, he emphasized that “we are ready to do business with the world”, and invited Member States to attend Malawi’s Annual Investors’ Conference, to be held in October. Stressing that regional and global markets must be free of distortions such as subsidies, tariffs and non-tariff barriers, he said the international community must live up to the aspirations of the World Trade Organization (WTO) Doha Agenda. Only by taking such steps would African countries be able to produce and add value to their commodities, thereby generating the jobs necessary to retain young people in Africa and propel its economies to sustainable growth and prosperity. Such investments would also reduce the risk of youth being lured into radicalism and extremism, he said, underlining his commitment to promoting youth development and harnessing the demographic dividend within Malawi. On United Nations reform, he said Malawi espoused the Ezulwini Consensus and the Sirte Declaration in the belief that the Sustainable Development Goals could not be achieved without representation, fairness, efficiency, transparency and accountability in the Security Council.